ATHENS, Greece, August 26, 2014 (ENS) – Wildfires devouring forests in the central and southern parts of Greece are being extinguished with the help of the European Union’s Civil Protection Mechanism. France responded to Greece’s request for assistance in a matter of hours. 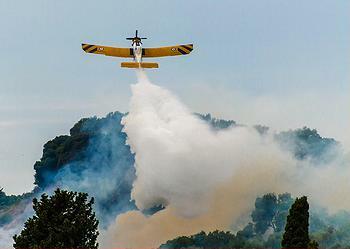 Two French fire-fighting planes are now battling the fires. On Tuesday, firefighters were still trying to control a large wildfire in Greece’s southwestern Peloponnese some 200 kilometers (124 miles) southwest of Athens. The woods caught fire Monday in Zerbisia near the historic village of Meligalas. Blown high by strong winds and fueled by high temperatures, the blaze spread out of control, filling the air with thick smoke. Authorities were forced to evacuate parts of four villages and take emergency measures to safeguard Ancient Messene, the site of a city founded in 369 BC. The ruins are a major historical attraction. 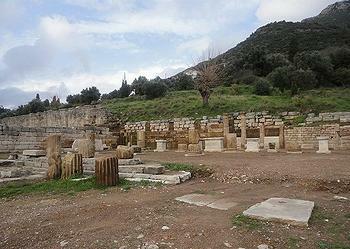 Much of Ancient Messene has been archaeologically excavated and partly restored or preserved for study and public viewing. Greek firefighters now have brought this fire under partial control due to the efforts of nearly 200 firefighters and soldiers and the work of seven water-dumping aircraft that arrived on the scene at dawn Tuesday. “Forest fires are a risk we face every summer and this year is no exception; we will continue to support the efforts of Greece to prevent the fire from spreading towards populated areas,” said Kristalina Georgieva, the European Union Commissioner for International Cooperation, Humanitarian Aid and Crisis Response. “The Commission is grateful to France for its prompt gesture of solidarity; I hope that other Member States will also be able to offer assistance,” she said from her office in Brussels. One fire that broke out Sunday in a forest region near Kalabaka, central Greece, has burned around 400 hectares of land and is still active. Last week firefighters in Greece were battling at least five fires all across the tinder-dry country, while fires at the end of July took water drops by the Hellenic Air Force to extinguish. As a result, the Greek government has imposed a ban on throwing lit cigarettes, burning dry bushes and branches, using machines and tools which produce sparks such as welding equipment, as well as on lighting a fire for an outdoor barbecue. The burning of crop stubble is banned too, as is walking in forested areas after 10 pm. To help pinpoint where fires are breaking out Greece has activated the satellite imagery service of the European Commission. Тhe Copernicus mapping system provides all actors involved in the management of disasters and humanitarian crises with timely and accurate satellite images of the affected areas. The satellite imagery service can be activated only by authorized users, such as national civil protection authorities, through the European Commission’s Emergency Response Coordination Centre, ERCC. The European Civil Protection Mechanism facilitates cooperation in disaster response among 31 European states – the EU-28 plus Norway, Iceland, and the former Yugoslav Republic of Macedonia. The ERCC is actively monitoring the forest fire risks across Europe. It uses national monitoring services and tools such as the European Forest Fire Information System and satellite imagery to provide an overview of the situation in Europe. Every summer, its experts hold a weekly videoconference with national authorities from countries at greatest risk of forest fires. The participating countries pool resources that can be made available to disaster-stricken countries all over the world. When activated, the Mechanism coordinates the provision of assistance, and the European Commission manages the Mechanism through the ERCC.